LAREDO, the United States, Oct. 22 (Xinhua) -- Though the bustling border metropolis may not be the first city of the United States that comes to people's mind regarding global trade, Laredo, a city with a population of about 250,000 in southern U.S. state of Texas, is a veritable international trading giant. Laredo owns the busiest inland port along the U.S. southern border, which is also the second busiest port overall in the country, trailing only the Port of Los Angeles, California. China is the city's second largest trading partner, with neighbouring Mexico the first. China's trade volume with Laredo increased 5.23 percent to 4.02 billion U.S. dollars in 2017. Olivia Varela, president and CEO of Laredo Economic Development Corporation, told Xinhua in a recent interview that China is one of the major trading partners of Laredo with the top trading commodities being electronics, textiles and automotive parts. "One of our major trading partners is China, last year with a five percent increase in trade coming in from China into the United States through this port of entry. So we considered China one of our strongest trading partners that is critical to this region," Varela said. Varela's comments were echoed by Mayor of Laredo Pete Saenz who seems like an energetic and enthusiastic salesman when pitching Laredo as a business-friendly city. According to Saenz, there is a small Chinese community in Laredo, mainly in restaurants and other service businesses. More Chinese investment and businesses are highly welcomed in the city. "Chinese are known for your innovation, ingenuity. You can basically do so many things. You can add value to whatever commerce we have coming from Mexico into the United States and vice versa," Saenz said. Talking about the advantages of Laredo, Saenz said that logistics, distribution and abundant natural resources of energy and water make the city competitive for Chinese investors. "So we have the necessary ingredients to provide anyone willing to do light manufacturing or even heavy manufacturing," he said, adding that "Laredo has land that can be provided as an incentive." With the ongoing trade friction between the United States and China, both Varela and Saenz said they haven't seen negative impact on trade figures. Varela expressed the hope that those issues could be resolved as soon as possible. "We fully expect that once all of these issues are resolved, we will have a much strong relationship and anything that is currently being put on hold will just continue to move forward. We have a very positive outlook for once this is all resolved that we're going to see probably a much more significant growth than that five percent in our trade," she said. Saenz believes that by continuing and expanding trade with China, Laredo can set a good example to the world. "We will continue doing business as we have for years and years. And let's be a showcase to the world that we've got to focus on what we do best and we've done it." The mayor also told Xinhua that he and other Laredo officials had met with representatives of the Chinese city of Suzhou, a major trade and economic center in eastern China. Although discussions between the two cities are in the early stages, Saenz said officials from the two cities are working on developing a relationship. "So come to see the border and see if it suits your needs and if it doesn't, we'll talk and we'll make it suit your needs," Saenz said. "Just give us the opportunity to demonstrate our willingness and our capacity and our resources that we have to provide to any investor that is willing to do business in Laredo, Texas." 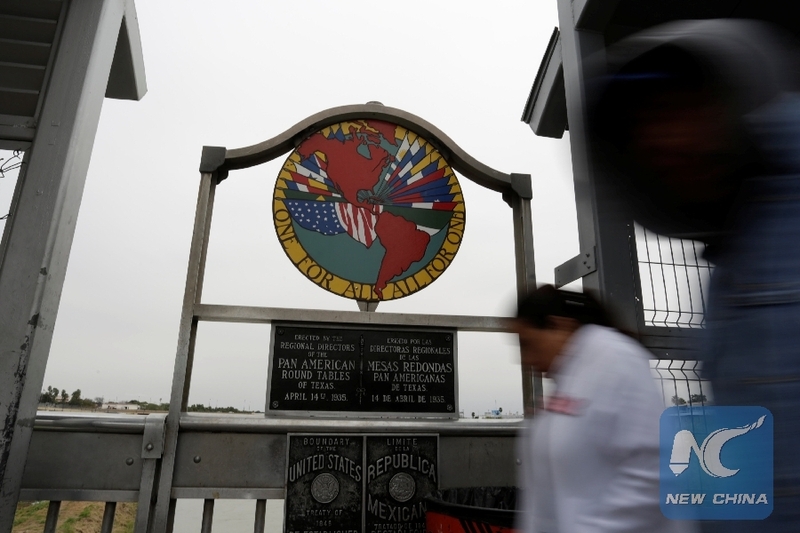 Trade is not the only bridge that links the U.S. border city with the world's second largest economy. Over the years, Texas A&M International University (TAMIU) in Laredo has sent over 100 students to China to cultivate better understanding of different cultures and establish a global vision for future leaders. Triana Gonzalez Valdez, director of the Office of International Engagement at TAMIU, explained to Xinhua that the university has different types of exchange programs with Peking University, Southwestern University of Finance and Economics in Chengdu and City University of Hong Kong. Each year, more than 30 students from TAMIU are sent to China through various exchange programs ranging from summer camps to one-year courses. At the same time, Chinese students from those partner universities are also sent to TAMIU to spend a certain period of time. Valdez said exchange programs with China are very popular among the students. Amazed by China's rich culture and history, students always have "tremendously positive" feedbacks when they return from China. "Students are fascinated with the Chinese culture and Chinese language. And a lot of them go for a semester and decided to stay for a longer period of time or decide to go back in teaching English in China," she said. "They grow so much personally. They become more independent. They become more sensitive to other cultures, more aware of diversity and other cultural, social and political issues around the world. So when they come back, they are more globally aware of what's going on in the world," Valdez said.